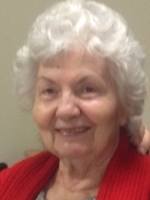 ALBANY – Rose Mary Wildman, 87, of Albany, passed away Wednesday, November 4, 2015 at the Capital Living Nursing & Rehab Centre in Schenectady. Rose was born in Brooklyn, the daughter of the late Constantino and Bella “Adele” Ferrenti Marullo. She moved to Albany in 1946, and here she was employed by the Whitney’s, Myers, and Muhlfelder’s department stores. Rose enjoyed knitting, crocheting, reading, and playing her keyboard. Rose was predeceased by her husband Colin G. “George” Wildman, and by her daughter Margaret Wildman. She is survived by her children Georgette Salsburg (Jerome) of Albany, Jeanne Pezzulo (Paul) of Latham, George M. Wildman (Carol Steven) of Clifton Park, and John J. Wildman (Carol) of Greenwich; several grandchildren and great grandchildren, and by many nieces and nephews. She was also predeceased by her dear friend and companion Armand Pezzula. The family would like to extend their thanks to the staff of the Capital Living Nursing & Rehab Centre for the kindness and care they provided to Rose during her stay. Funeral services will be held in the Hans Funeral Home, 1088 Western Ave., Albany, Monday morning at 8:30am, and from there to The Historic Church of St. Mary on Capitol Hill, Pine & Lodge Streets, Albany, at 9:30am. Relatives and friends are invited, and may call at the funeral home Sunday from 4-7 pm. The family suggests memorial contributions to the Sisters of St. Joseph of Carondelet, 385 Watervliet-Shaker Road, Latham, NY 12110. To leave a message of condolence for the family or obtain directions to the funeral home, please visit www.HansFuneralHome.com. Cheryl and I were saddened to hear about the recent passing of your mother. Please know that we are thinking of you and have you in our prayers during this sad time. Our deepest and most sincere condolences.